← Love and Wine: A Thirst for Romance? I am tired, grouchy, and as one of my crew said, “man, you need a holiday so bad.” Okay, so his grammar’s not the greatest, but when my entire crew – and Susan as well – seem to be conspiring to convince me I need some time off, I take note. I have to admit, it’s been a few years since I took a real vacation. True, I’ve been doing a lot of traveling lately – but all of it business. When you travel on business, every airport and hotel room look pretty much the same. So what to do and where to go when it’s just for fun? My crew came up with the suggestion of a road trip and wine tour. “You know, like those two guys in Sideways.” Road trip it is then. The plan is to have no plan – no set itinerary, nowhere I have to be on a given date or time. In a few days – after yet another business trip – I’ll pack my bags and head south with California my ultimate, if somewhat vague, destination. Along the way, I’ll be stopping in Washington and Oregon, exploring their wineries and tasting rooms as fancy guides me. I might even take a balloon ride to get an aerial view of the Oregon vineyards. My work in the movie business revolves around planning – often to the minute, always to meticulous detail – for days on end. This holiday my only planning has been to download a few maps and general information about the various regions and to buy a new digital camera. If you’ve got any suggestions or stories about favourite wineries and restaurants along the way, I’d love to hear them. I’ll be posting intermittently along the way and will be back home sometime later in the month… or maybe not. Photos from Tyee Winery in Oregon. Here are some of the links Frank found plus a few extra and some neat info gleaned from the various websites mentioned. – Oregon ranks second in number of wineries in the US and third in wine production. – In less than 30 years, Oregon increased from 5 to over 300 wineries and from 35 acres under vines to over 13,400. – Sales of Oregon wine has increased 1,200% since 1989. – 40 different types of wine grapes arehttp://www.blogger.com/img/gl.link.gif grown in Oregon. 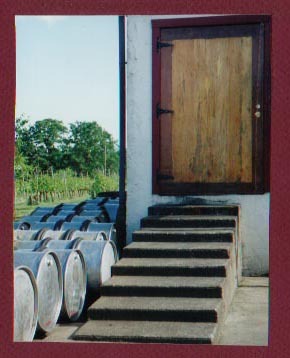 – Washington is ranked second largest premium wine producer in the United States. 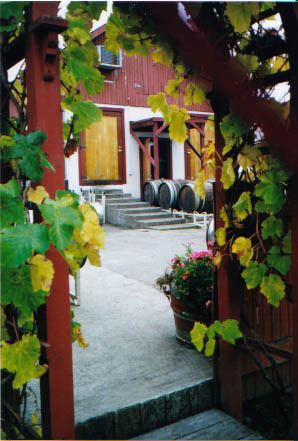 – More than 460 wineries grow over 20 grape varietals. Leading red varietals: Merlot, Cabernet Sauvignon, Syrah, Cabernet Franc, Sangiovese. Leading white varietals: Chardonnay, Riesling, Sauvignon Blanc, Semillon, Viognier. This entry was posted in pinot noir, sideways, washington wine, west coast wines and tagged Cabernet Franc, Cabernet Sauvignon, Oregon, Sauvignon blanc, Sémillon, United States, Viognier, Washington wine. Bookmark the permalink.